One of the biggest mistakes people make when shopping for a snow blower is that they wait until it snows before investing in a two-stage snow blower. You really should buy a snow blower long before the snow hits. Preparing for heavy snowfall means you’ll be able to handle whatever depth of snow you get, because when a big snowstorm is announced everyone in your town or city runs to the local hardware store looking for one, which means they often sell-out, leaving you scrambling to find anything. You don’t want to be desperate when making your purchase. Basically, now is the best time to invest in a snow blower. The sooner the better. The best part about planning ahead is that you can choose the the snow blower you actually want, not the one that’s in stock. Let’s be honest, a 2-stage snow blower isn’t cheap so it make sense that you get the most out of your money and invest in a high-quality snow blower by doing your research and looking at the facts before making a decision. And that’s why you’re here, reading this. We’ve done all the research so you don’t have to. Now that the days are growing shorter and winter is fast approaching, it’s time to pack the lawnmower away and dust off the snow blower. If you’re considering a new 2-stage snow blower, now is the time to act. The closer we get to winter, demand for snow blowers will increase and so will the prices. For larger areas, like a long driveway, a 2-stage snow blower is way better than a single stage machine. They’re also better for deep snow and working on an incline. The downside to choosing a 2-stage snow blower over a single stage one is that they cost more. Fortunately, they’re not as expensive as 3-stage machines. But the price that one can expect to pay for a 2-stage snow blower can be a bit daunting. So we set out to find some affordable machines that will stand the test of time and have come up with a comprehensive list of the best 2-stage snow blowers under $1000. Of course, prices change, special offers come and go, so you can never be sure exactly what you’ll be paying. What we can say is that, at the time of writing this review, all of the snow blowers that we’ve selected cost less than a thousand dollars. There is one exception, the Husqvarna ST224P costs a little more than $1000. I know there will be many Husqvarna fans reading this review, it’s a much sought after and revered brand. 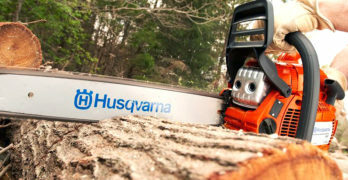 We all know that one has to pay a little extra for this type of machine, Husqvarna are known as one of the best. Since this model is only a snippet over a thousand bucks, I’m sure we can be forgiven for including it. It is considered by many to be the best 2-stage snow blower and worth the extra few dollars. With all things considered, these are great machines and have proven to be very popular. So I have no doubt that you’ll find a 2-stage snow blower to match your budget and meet your expectations among the models that we’ve selected for this review. Can easily handle snowfalls in excess of 12″ or more. Heavy-duty aluminum gear case with alloy steel gears. Engineered to throw snow further with minimal blow-back, the high-speed impeller takes in more snow while the elongated chute provides a tighter discharge. View or download the SPECS. View or download the ENGINE MANUAL. If you’ve set a budget of $1000 and are looking for a 2-stage snow blower that is going to do what you expect it to, the Yardmax YB6270 is sure to put a smile on your face. It’s well under a thousand dollars, leaving you with enough spare cash to treat yourself. Though, can a 2-stage snow blower this cheap really make the grade? It certainly appears to be worth every cent of its very reasonable price. We need to remember that Yardmax is not an industrial or commercial brand. Their aim is to provide affordable garden equipment for the home user. In this context, I can truly say that the Yardmax 2-stage snow blowers are excellent value for money. The Yardmax YB6270 is the mid-sized model in their lineup of 2-stage snow blowers. It has a 24” cutting path. There’s a smaller machine (22”) and a larger one with a 26” path. The 24” YB6270 should be more than adequate for most of us. The steel housing, chute and serrated steel augers are all of a high quality standard and will perform well under normal domestic conditions. The aluminum gear case which houses steel alloy gears is also tough enough to handle some heavy work. The 196cc, 6.5HP engine is okay and is reliable. Though I’d recommend opting for the LCT 208cc, 7HP engine with the added convenience of an electric starter. You have a choice of engines and the latter is more powerful, as well being a better designed engine. Like most snow blowers with an electric starter, the LCT engine uses 120V. You have to plug it into the mains to start the engine. This eliminates the need for a battery and alternator which cuts costs and reduces the weight. A backup recoil starter is fitted for when you’re not close to a power outlet. Even with the improved LCT engine, you’ll be paying a lot less than $1000 for the Yardmax and it weighs an acceptable 161-pounds. For an all-steel, gas-powered, 2-stage snow blower, this isn’t particularly heavy. The self-propulsion aspect makes it very manageable, even in heavy snow. You have easy control over six forward speed settings and two for reverse. Large 13” X 4” tractor-style wheels with solid steel rims give the snow blower excellent traction in heavy snow and ice. The axel has a pin lock to engage two wheel drive for improved traction or one wheel drive for maneuverability. You can easily plow through thick piles of snow thanks to an intake depth of 21”, it uses a 12” auger and the impeller is also 12” in diameter. I don’t have specs indicating how far the snow is expelled from the chute, but I would guess that it is similar to most 2-stage snow blowers of the same size. Unlike the more expensive Yardmax YB6770, the YB6270 does not have a user dashboard or a headlight. You control the chute using a conventional crank handle and the gear controls are also by means of handle that extends from the base of the machine. It has soft grip handles and the accelerator controls are well-placed on either side of the motorcycle-style dual handles. Poly skids and drift cutters are available as optional extras and won’t add much to the price if you choose to include them as part of your purchase. As one of the cheapest 2-stage snow blowers available, the Yardmax YB6270 is a refreshing find. It’s not a flimsy machine and can handle just about anything you throw at it. A couple of users have said that it isn’t too easy to assemble. Even accomplished DIY guys take about 30-40 minutes to get the Yardmax up and running. Though once you have everything in place, this is a great machine to use. It’s an accomplished 2-stage snow blower at an even better price and comes with a 2-year residential warranty. A well-designed 2-stage gas snow blower that is both affordable and well-made. For most homeowners, this is a great buy. Best 2-Stage Snow Blower under $1000 — with a wide clearing path of 30″ and a clearing height of 20-inches. 30 inch, 2-stage self-propelled gas snow blower. ✓ View or download the MANUAL for the Dirty Hand Tools 103879. The Dirty Hand Tools 103879 just makes it onto our list of 2-stage blowers under $1000. Some retailers have it priced above this, but you can usually expect to find it under a thousand bucks, but don’t expect any change. Though it certainly is worth every dime. Not only is this brand a notable rival among the best, this particular model is big enough to handle more than most and comes with every feature one would hope to find. Providing the power for this big machine is a mighty 302cc Loncin engine. This makes it one of the most powerful 2-stage snow blowers in its class and probably a bit thirstier than others. I don’t have the fuel consumption figures to compare, but I’d guess that at 309cc, it’s going consume more gas than the smaller engines. I’m not too sure how much time you’ll get from the 1.06-gallon gas tank. Though this power is used to good effect. It has a great capacity with a 30” clearing path. Though with a smaller intake and slightly lower auger diameter, it doesn’t have quite the same depth capacity as the much cheaper Yardmax reviewed above. I don’t think that this will be very noticeable in most cases. A 20” intake with 11” steel augers, isn’t much less. The 3-blade 15” impeller is excellent at blowing the snow and ice a good distance from the machine – up to 40-feet. It also has a fully rotational chute, allowing you direct the snow in any direction within 190°. Durability is uncompromised. With its heavy-duty steel frame and rust resistant exterior, the Dirty Hand Tools 2-stage snow blower is going to keep going strong for many years. It also has all the modern conveniences to make your life simpler and easier. This includes a great user dashboard with all the controls at your fingertips. With 6 forward gears and two reverse, along with excellent high-tread wheels, it moves through heavy snow like a dream. They’ve also included heated grips for added comfort and a bright LED headlight. Starting is made easy by means of a 110V electric starter. That big engine and all the heavy-duty steel used in its construction, makes the Dirty Hand Tools a heavy machine. At 248-pounds, portability is not its strong point. Though, on the bright side, it’s a mighty tough piece of equipment with power to spare. Like all 2-stage snow blowers, self-propulsion is a given and the extra horsepower from that engine makes it easy to glide the machine, even on quite an incline. Reversible skid shoes are included and you also get a clog removal tool with your purchase. You’re really getting a lot for money with the Dirty Hand Tools 30” 2-stage snow blower. It will make light work of large areas and it certainly has the power to contend with any situation. Convenience and comfort are fully taken care of, making this one of the easiest big 2-stage snow blowers to use. It’s a remarkably tough machine with virtually no plastic to be seen anywhere and you have the reassurance of a 2-year warranty. Engineered for use in all snow conditions, 6-18 inches deep. The “P” stands for power steering, making it easy to maneuver in deep snow. Sound pressure level at operator’s ear- 88.4 dB, guaranteed sound pressure level of 105dB. Few garden power tools have the same reputation as Husqvarna. So even though you’ll probably be paying a little more than $1000 for the Husqvarna ST224P, you need to keep in mind the pedigree that comes with this prestigious name. Its popularity is clear evidence that many feel it’s worth paying extra for superior Husqvarna engineering and after sales service. My experience with Husqvarna products is that they outlast most others and remain reliable. So, I for one, agree that it’s worth paying a little extra for a 2-stage snow blower of this quality standard. The Husqvarna ST224P is powered by the reliable LCT 208cc engine, with electric starting. I think this is the same engine used in the upgraded option for the Yardmax YB6270. Though, Yardmax have it specified as a 7HP engine and, on the Husqvarna website, this is listed as 6.3HP. I can offer no explanation for this, nor am I sure which is the correct specification. By all accounts, it appears to be exactly the same engine. Apart from this slight confusion over the actual power output, no one can deny that this is a fine and durable engine. Husqvarna have a 5-year guaranteed to start policy with this engine. The gas tank isn’t as big as one would expect, it only holds 0.7 gallons. You may have to refuel more often that you’d like to. Using the same engine, the Husqvarna matches the cutting path of the Yardmax (24”). The 12” ribbon auger is as effective as it is incredibly durable, with a rated cutting depth that’s adjustable from 6” – 18”. It also has enormous 15” high-traction wheels. Combined with superbly balanced power steering, the Husqvarna ST224P is an easy machine to work with. Adjustable skid shoes are another great feature, you can adapt to any type of surface. It has 6 forward speeds and 1 reverse gear. The Husqvarna friction disc transmission makes for effortless and smooth speed transitions. Driving through an aluminum gearbox means ultimate durability and a good reduction in the overall weight. The Husqvarna ST224P weighs a very reasonable 198.6 LBS. All your controls are perfectly placed on the user dashboard right in front of you. Rotating the chute or changing speed is easily done on the go. It also has a loop handle which is heated for added comfort. This handle is easily adjustable with 3 height positions. Large accelerator controls on either side are also easy and comfortable to use. Two bright LED headlights illuminate your path for quite a distance. I’ve always found Husqvarna equipment to be among the best. Some may disagree, but I feel that the Husqvarna ST224P is probably the best 24” 2-stage snow blower there is for home use. It is built Husqvarna tough and has all the features one wants for ease of use and comfort. The engine, auger and gearbox (the really important stuff) are all covered by an amazing 5-year warranty. The rest of the components have a 3-year warranty. Impressive technology as it’s a feat of engineering to have a dual-stage snow blower powered by batteries. Truly a wonderful battery-powered 2-stage snow blower, engineered for those who want the convenience that it offers. No fumes, no cords, lightweight and quieter than gas-power. Best 2-Stage Snow Blower under $1000; completely powered by batteries — unthinkable even a few years ago. Advanced 4-speed digital drive system (3-speed & XPORT). Two 40 V batteries deliver up to 30 minutes (5.0 Ah) | 40 minutes (6.0 Ah) of whisper-quiet runtime and zero carbon emissions. Traditionally, we’ve always thought of 2-stage snow blowers as noisy gas-powered machines, with some corded electric models also being available. An electric snow blower has the advantage of virtually no noise, effortless starting and no unpleasant gas fumes. But you’ve always been limited by the length of your extension cord. Not to mention, the hassle of having a cord trailing behind you everywhere you go. Now that battery-powered tools have become more powerful with longer working times, it’s possible to use this technology in a machine as powerful as a 2-stage snow blower. Though, we all know that cordless machines can be quite expensive. It’s really great to see that Snow Joe has introduced a battery-powered 2-stage snow blower that not only costs well under $1000, but is also capable of meeting the requirements that we would normally associate with noisy, gas guzzling, fume belching beasts. The Snow Joe ION8024-XR will be the envy of your neighbors as you quietly churn away heaps of snow from your driveway and all the areas of your yard where a 2-stage snow blower is the only machine for the job. 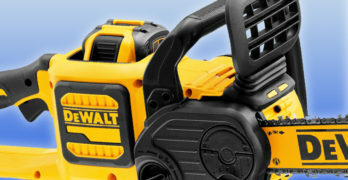 Using 2 X 40V 5AH lithium-ion batteries, the 80V MAX Snow Joe has the power to match many of its gas-powered competitors. 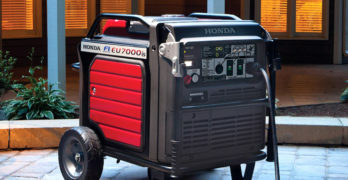 It utilizes an incredibly efficient and immensely powerful 2500W brushless motor, which is roughly the equivalent of a 3.3HP gas engine with a good deal more torque. Because of the efficient use of power, this electric motor can compete with gas engines with about twice the amount of horsepower. Giving the Snow Joe ION8024-XR the ability to chew through snow and ice up to 13” in depth with a width of 24”, at a rate of up to 1000 pounds per minute. This isn’t far behind the 6-7 HP gas-powered machines. The only issues with using batteries is the limitations that it places on your runtime. Drawing that much power from two 5Ah batteries might leave you thinking that you won’t be able to work for any reasonable length of time. Snow Joe claim that you can get up to 30-minutes from the dual battery setup. Though, if you’re working at full power in heavy snow, I’d say that you can realistically expect about 15 – 20 minutes of running-time. This would mean buying at least two extra batteries (iBAT40XR) if you have an average sized yard, another two would be better in most cases. Even when buying another four batteries, your total cost is likely to be under a thousand dollars. So it still works out as a very economical option. You won’t be buying gas or be paying regular service costs. The efficiency of the DC electric motor means that you probably won’t notice any increase in your electricity bill either. The Snow Joe only has 3 forward speeds and 1 reverse. Though because of the almost instant torque that you get from the electric motor, I doubt that this will be any less effective than the 6-speed gas machines. There’s an additional X-Port speed which is like a turbo boost for a short burst of power when you encounter some heavy, compacted ice or snow. This will, however, drastically reduce your battery power, so one would be using this feature sparingly. The batteries have electronic management to keep the power constant as the battery charge drops, so you won’t really notice any real drop in power as you work. The snow will be blasted up to 32-feet away by means of an equally efficient impeller. It has a fantastic user dashboard with LED displays indicating your direction and speed selection. This is done with the touch of button. It also has a 180° directional chute which is super easy to adjust. Powerful LED headlights have been included, along with height adjustable (and reversible) skid shoes. An auger cleaning tool clips neatly onto the top of the intake cover. While this is a durable machine with a rust resistant steel auger and a pretty tough frame. It isn’t quite as durable as any of the others. For example, the chute is molded from plastic, whereas all the others that we’ve reviewed so far have steel chutes. This has the advantage of reducing the weight to 105.8 LBS, a lot lighter than any of gas-powered machines. This weight reduction isn’t entirely as result of more flimsy materials, the electric motor is also a good deal lighter than any gas engine with a similar power output. 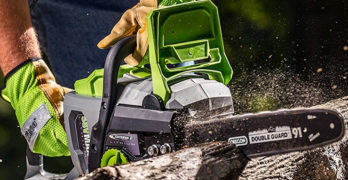 In today’s world, where zero emission machinery is the buzz word on everyone’s lips, battery-powered tools are becoming all the more popular. Thanks to advanced engineering, you are no longer compromising when going for cordless electric tools or machinery. Your energy cost to power output is much cheaper thanks to the super-efficiency of the modern brushless electric motors used in cordless machines. They are much more efficient than traditional 120V or 240V AC electric motors. Clears a path 24-inches wide by 13-inches deep in a single pass. The only thing you really need to consider is how many batteries you need to keep working for a reasonable length of time. This isn’t difficult to achieve. You have basically no maintenance costs on the Snow Joe ION8024-XR and you don’t have the inconvenience of lugging a heavy machine to the dealership every so often for routine service. It is covered by a full 2-year warranty. Can handle snowfalls up to 12 inches deep, throwing snow up to 25 feet away from the snow blower. Powered by a Champion 224cc cold-weather engine. 12-inch (30.5 cm) carbon-steel auger, you’ll easily cut through day-old packed snow and ice at top speed. Chute control handle’s convenient location allows you to quickly take control of where you want all that snow to go. 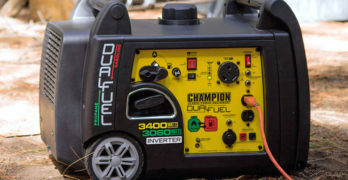 Homeowners, looking for cheap and reliable gas-powered machines, often turn to Champion Power Equipment to meet their needs. The Champion 100434 is the cheapest in this review, by quite a margin. You can almost buy two of these 2-stage snow blowers for under $1000. While it’s a very competent piece of machinery, I wouldn’t rate it as the most robust snow blower on the market. There are more plastic components than I’d like to see on a heavy machine for outdoor use. With that said, the essential working gear is of a good quality standard. The auger is made of carbon steel and the impeller is also constructed from a good grade of steel. When it comes to features and functions, the Champion 1000434 has all the basics, but none of the fancy stuff. If you need a mid-sized, powerful 2-stage snow blower and don’t see the sense in paying for any extras, this is the product for you. The price does kind of make it irresistible if you’re on a tight budget. Whilst being really cheap, and fairly basic, it has everything you need. The reliable 224cc engine is designed for easy starting in cold weather and has a 120V electric starter with a 6’ electric cord. Like all the electric starting snow blowers, it has a recoil starter for those times when this is needed. This power is transferred through a good transmission, giving you six forward speeds and two reverse. It has the capabilities to match most in its class. The 21” clearing height and 12” auger is on a par with snow blowers that cost considerably more. It has a 24” clearing path, like most of the others in this review. The hardened steel impeller is certainly durable enough and is capable of blowing snow up 25-feet from the chute. The chute has 190° rotation and is controlled by a crank handle. There’s no dashboard or headlights, but I wouldn’t expect any of these upmarket features on a snow blower at such a low price. The dual handles are comfortable enough with soft rubber grips and are height adjustable. It has the standard dual accelerator setup – one for left and one for right. They’ve included a chute cleaning tool which clips to the top of the intake for easy accessibility and storage. It also has 6” skid shoes and you get four spare shear pins with the machine when you buy it. Including additional shear pins is a great idea, as these are the items that regularly fail on snow blowers. This even happens with the top brands. If you don’t need an industrial grade 2-stage snow blower and don’t see the sense in paying extra for luxuries like heated grips, headlights, or a user-friendly dashboard, the wonderfully affordable Champion 100434 is just the thing you’ve been looking for. I like the no nonsense approach to this 2-stage snow blower and am quite blown away at how cheap it is. Despite its low price, the Champion has a warranty that matches many others – 2-years. Sure this isn’t as impressive as that offered by Husqvarna and many of the more expensive snow blowers. But this is in a very different league – it’s a lot cheaper. Maximum Throwing Distance 25.0 ft.
Do you need a 2-stage snow blower? If one compares the price options when buying a new snow blower, the question will arise as to whether a 2-stage (or even 3-stage) snow blower is really necessary. They are more expensive than single stage machines and no one wants to spend more than they have to. A 3-stage snow blower is seldom necessary for home use, they are generally commercial machines and are the most expensive. So most homeowners want to know what the difference is between a 1-stage and 2-stage snow blower. To provide clarity on this question, I’m going to discuss the three different types of snow blowers that are available. Knowing how each type of snow blower works and what they are used for, will help you decide which is going to be the best snow blower for you. All snow blowers use an auger to scrape and lift snow and ice from the ground. They are all used to clear snow from driveways, walkways, porches and other areas where we need to gain access. A single stage snow blower uses the auger to lift the snow and expel it from a chute in one single action. They don’t actually blow the snow from the chute, but rather use the auger to fling or throw it away. For this reason, single stage snow blowers can also be referred to as snow throwers. They are always smaller than the other two types of snow blowers. The smallest of these are electric snow shovels, which are basically small handheld single stage snow throwers. Because the auger is used for more than just lifting the snow, a single stage snow blower is less effective at removing large quantities of snow and ice. The top half of the auger needs to be clear of the snow in order to throw it upwards. You, therefore, can only cut into snow that is lower than half the diameter of the auger. A 10” single stage auger will only be able to handle snow that is about 5” deep. Single stage snow blowers don’t work well on an incline. The motion of the auger is used to propel the machine forward, as well as lifting the snow and throwing it out of the chute. These machines generally have smaller, less powerful engines or electric motors, when compared to 2-stage and 3-stage machines. So the combined effect of an auger that’s working harder and a less powerful engine, mean that a single stage snow blower simply doesn’t have the power to propel it up an incline. For these reasons, a single stage snow blower is limited to clearing pathways and short driveways that don’t have heavy snow build up. A single stage auger makes direct contact with the surface that it’s clearing. This means that they are also unsuitable for use on gravel and can only be used on paved surfaces. Despite these limitations, single stage snow blower have their place. Because they are smaller and lighter than 2-stage machines, single stage snow blowers are the best for areas where a large machine cannot gain access, like narrow pathways. They are easier to use and require less storage space. Above all, single stage snow blowers are the cheapest option. If you don’t have a long driveway, your yard is fairly flat, and you don’t experience heavy snow, a single stage snow blower is likely to be your best option. A 2-stage snow blower also uses an auger to lift snow and ice from the ground. The difference is that these machines have a separate impeller that blows the loosened snow and ice out of the chute. This two stage action makes the auger much more efficient, it is only tasked with the job of lifting the snow from the surface and not expelling it from the chute. This means that a 2-stage snow blower can remove a lot more snow much quicker. The auger is able to cut into snow and ice using its full diameter and can, therefore, remove snow that is much deeper. They are usually bigger machines with a wider cutting path. Because a 2-stage snow blower is bigger, has a larger engine, and has more components, it will always be heavier and more bulky than a single stage machine. They are obviously less portable and require more storage. A 2-stage snow blower won’t negotiate small tight areas and can only be used in wider areas that accommodate their extra width and wider turning circle. They are, by virtue of their bigger size and greater sophistication, more expensive. Like a single stage machine, 2-stage snow blowers use the auger to move them forward or backwards. The improved power at the auger and a different design, make these snow blowers more capable of negotiating an incline. The auger doesn’t make direct contact with the ground and can, therefore, be used on uneven, gravel surfaces. This means that there will be a thin layer of snow that is not removed, but most 2-stage snow blowers include scraping tools that will clear the small amount of snow or ice that is left behind by the auger. The disadvantages to buying a 2-stage snow blower is mostly their price and the fact that they will use more fuel due to the larger engine. Other factors that may detract one from choosing a 2-stage snow blower may be that they are heavy and require a larger storage area. They are not suitable for small areas like narrow pathways. Though, if you need to clear more than a short driveway or pathway, a 2-stage snow blower is going to be much more effective. They are also capable of clearing much deeper, heavier snow and can go up a hill. If you need to clear unpaved surfaces, a 2-stage (or 3-stage) snow blower is your only option. These are the biggest and most expensive type of snow blower. They will have a bigger engine, larger auger and are, therefore, capable of removing the most snow and usually blow it further away. The main difference between a 3-stage snow blower and the other two, is that the wheels are driven by the engine. They don’t use the auger to propel them. This makes for a more powerful auger action and the snow blower can move through much heavier snow without being bogged down. Because of their size and price, few homeowners see the need for a 3-stage snow blower. They are preferred by commercial clearing companies and farmers who require the extra capacity that these big machines offer.